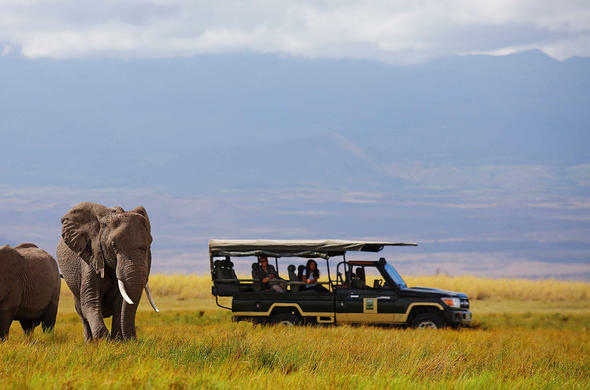 Explore Amboseli in custom open-sided 4x4 safari vehicles or walk with your Maasai guide in the bush. This safari lodge also offers Elephant Research excursions. At Tortilis Camp your African Safari in Kenya includes thrilling bush breakfasts, picnic lunches and romantic sundowners at scenic spots. The resident guiding team consists of highly trained driver guides as well as experienced Maasai guides for foot and birding safaris, so you will be in excellent hands on all your adventures. Amboseli National Park and the adjacent Tortilis land concession offer wonderful game viewing opportunities. Elephant, Lion, Cheetah, Hyena and Jackal, Buffalo, Wildebeest, Giraffe, Zebra and many more roam this landscape. The wetlands in Amboseli attract an exciting range of bird species. You can spot Pelicans, Crakes, Kingfishers, Hammerkops and at least 47 varieties of raptor. The Acacia Tortilis trees around the camp are alive with thousands of weaver nests, which add meaning to the term ‘dawn choruses’.